Photo by Greg Stacey from the Torontoist Flickr Pool. 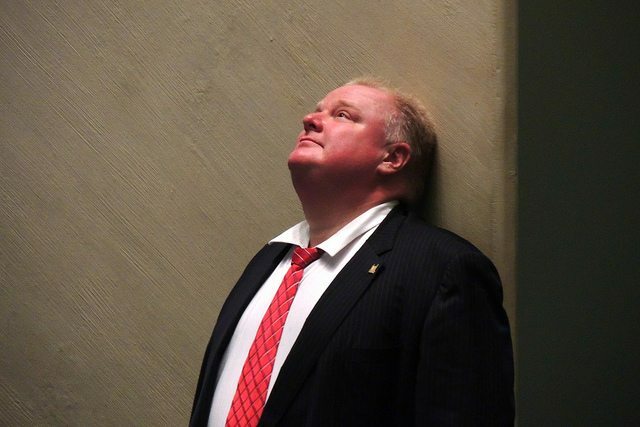 This morning, Rob Ford filed written notice of a personal leave of absence. His decision to take time away from his mayoral duties and re-election campaign was spurred by new allegations of drug use and inappropriate behaviour that emerged last night in three Toronto newspapers: the Toronto Sun released an audio recording of Mayor Ford making racist, homophobic, misogynistic, and lewd comments while intoxicated; the Globe reported on the existence of a second alleged crack video, this one filmed Saturday in Kathy Ford’s basement; and the Toronto Star revealed that Ford recently enjoyed a rowdy evening at Muzik nightclub that involved a dispute with none other than Justin Bieber. “It is the time for the media to leave Mr. Ford and his family alone. Mr. Ford has challenges to deal with both emotionally and physically. She did not insist the mayor step down, instead stressing that it would be up to voters to render a verdict in the coming election. Like Chow, though, Stintz stopped short of calling for the mayor’s resignation. UPDATE: May 1, 2014, 10:40 AM This post has been updated with information about more recent statements from Olivia Chow and Karen Stintz.